With virtually the same rescue power and features as Channellock's bigger cutter, the 89--this new 87 rescue tool is one you don't want to miss. The tool is 2" shorter and 30% lighter than its "big brother" making it a more pocket-friendly tool, without losing the quality. You asked for a smaller rescue tool? You got it. This tool has five lifesaving functions in one compact design, and with its narrow jaw profile can fit into tight spots for easy usability. It can tear through metals of all kinds with its cutting edge, and can also be used as a pry bar. 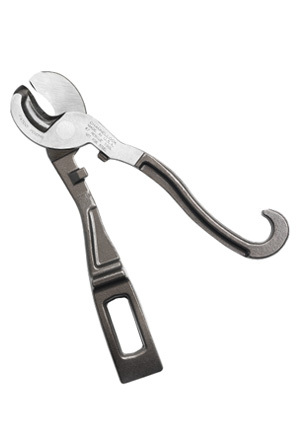 The built in spanner wrench can be used on up to 5" hose couplings, and the tool can be used to pry open windows, doors, and to shut off safety gas-valves. The question is, what can't this tool do? First Responders, the new Channellock 87 Rescue tool needs to be added to your must-have list. This tool won't slow you down, but will add to your efficiency on the job. For more details, product information, and easy ordering, click here.